Tokyo, Japan, June 2, 2015--Yokogawa Electric Corporation announces that it will release an enhanced version of the STARDOM™ network-based control system on June 3. The new STARDOM version features enhancements that reduce communication costs and ensure highly reliable monitoring and control. These enhancements meet a variety of needs in upstream oil and gas development and production, which Yokogawa is targeting based on its Transformation 2017 mid-term business plan. 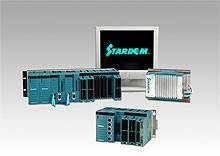 STARDOM network-based control systems consist of FCN/FCJ autonomous controllers and either a VDS or FAST/TOOLS SCADA server. FCN/FCJ controllers are ideal for the monitoring of oil and gas field installations, pipelines, and other widely distributed facilities that rely on satellites and other types of communications platforms for the transmission of data. In addition to eliminating communications delays and achieving high quality communications, the companies that operate such facilities are seeking to reduce communications costs by limiting the volume of data that needs to be transmitted. Personnel in central monitoring rooms rely on process data to monitor and control production facilities in the field. As all of the process data are sent to the SCADA server at regular intervals, communications costs are high. To address this and other needs, the FCN/FCJ controllers now support the DNP3*1 unsolicited response function and thus are able to immediately transmit only the most essential data to the SCADA server in the central monitoring room. Without impacting the reliability of monitoring and control, this reduces the amount of data that needs to be transmitted and helps to hold down communication costs. Differential pressure meters are widely used to measure gas flow rates. Depending on the mechanism that is employed to create the pressure difference, a variety of formulas developed by organizations such as the International Organization for Standardization (ISO), American Gas Association (AGA), and the Japanese Industrial Standards Committee (JISC) are used to calculate the gas flow rate. With this new STARDOM version, the FCN/FCJ controllers now support certain gas flow rate calculations based on the globally popular ISO5167 standard. The FCN/FCJ controllers already conform to the standards developed by the American Gas Association (AGA) that have been widely adopted in the Americas . With this added capability, the STARDOM controllers now support a greater variety of gas flow rate control applications. As the use of standard port numbers with a communication protocol leaves SCADA systems more vulnerable to unauthorized access, it is becoming a common security practice to restrict which port numbers can be used. Accordingly, Yokogawa has strengthened the communications function of its FCN/FCJ controllers to enable the selection of network port numbers based on the Modbus/TCP*2 communication protocol, which is widely used in industrial networks. This functional enhancement makes it possible for users to configure their systems in accordance with their security policies.